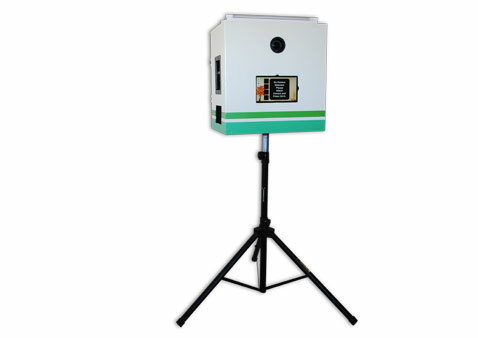 Our photo booth stand is a modern twist on the classic photo booth. Essentially, it’s like the traditional photo booth but minus the box, bench and curtains – that’s the easiest way to think about it. 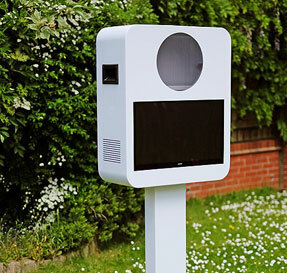 It’s an open-air photo booth. And with an open-air booth comes the opportunity to pack in way more people into a single frame. As simple as it sounds, you, a pair, a trio or a massive group of friends or family get together in front of the stand and smile, kiss, or stick your tongue out for some photo memories. You can model with or without our extensive suitcase of props. 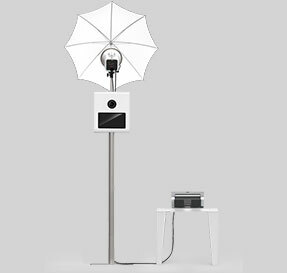 The high-resolution camera with DSLR technology and touch-screen pad are attached to a tripod or stand. The instant printer connects to the stand and sits on a table right next to it. So after your wacky, crazy or maybe normal poses, you can grab your photo strips or card right after they print and continue celebrating your event. One of our friendly staff members will come set up the photo booth stand for you. You do not need to worry about putting it together by yourself on your busy day. Also before the event, you will choose the backdrop for the stand, the layout of the photo strip and any logos on the strip you would like. Just like the standard photo booth, you have a plethora of props to choose from for the photo booth stand. The guests take their props, push the red button on the touch screen, wait for the three-second countdown, and say cheese for a single photo or for a four-photo strip. Either the organizer can choose the amount of photos taken before the event or the guest can choose on the touch screen before the countdown. And voilà! You instantaneously own printed memories to slide in a frame at home or post on your fridge.